Are you NEW to 5 Fandom Friday? Welcome and come join along! 5 Fandom Friday was created by myself and Super Space Chick in October of 2014, as a way to get all of our blogger friends keeping on task each week, building a community with our fellow bloggers and connecting with new and old friends once a week! We choose the topics, you do the writing! Let's get inspired together! 1. Popplers. I probably wouldn't eat Popplers as they are the young of the Omicronians, but they are so super cute that one as a lil buddy would be nice. Also the theme song for them is so catchy!! 2. Chocolate Frogs. Technically they are real now. BUT not magically real! 4. Wonka Bars. 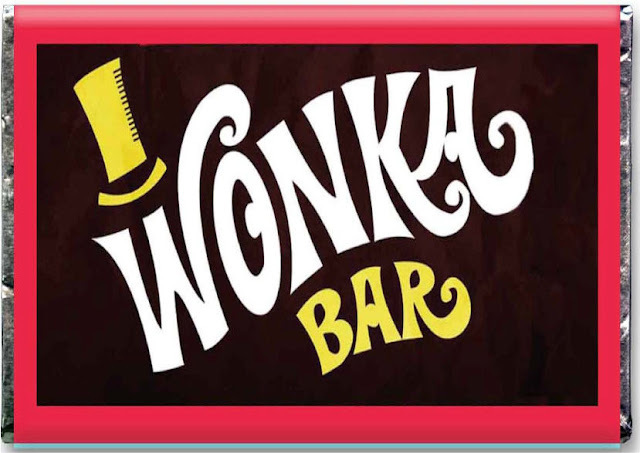 The only reason I need Wonka Bars to be a real thing is so they could come with golden tickets and the factory existed I could raid that candy room! 5. Slurm. Again like the chocolate factory. The Slurm factory is pretty rad. Until you find out what it is made of. BUT I would like to try it. At least ONE sip! YUM now I need to go eat some sweets! Thank God my birthday party Pies & Pies is tonight! Share your links in the comments below, on Twitter for a RT and on our Female Geek Bloggers page! I cannot wait to see what you all pick! September 4th, 2015: 5 Fandom Deaths I’m Still Upset About…SPOILERS! I wonder what Duff beers taste like. That's one I'd like to try I think! Happy birthday, sweetie! Eat all the pies for me (especially some damn fine cherry pie). Were you as disappointed as I was when they came out with real Wonka candy? It was so tiny and looked so different from the movie stuff. Ok, so now I'm hungry. So many of the Wonka sweets would have been amazing. And I'd have to try Soylent Green, just because! I can't believe I forgot Popplers!!! We affectionately refer to Chick-fil-a nuggets at Popplers :) I had Slurm on my list too - sure it's gross, but I have to try it! MMmm all the HP food. So tasty! I would want those full meal candies Wonka makes! OooooOooooo YES to Firewhiskey too! !